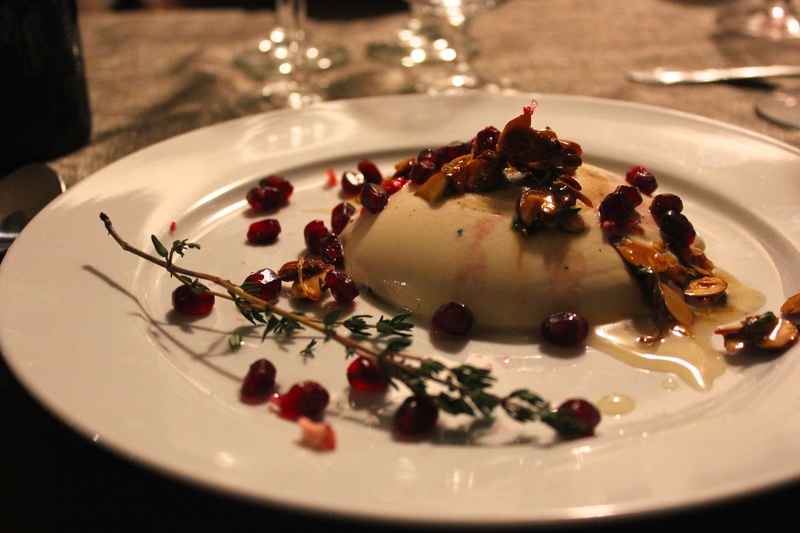 I made this panna cotta to end an epic four course meal with wine pairings. For me, this was the highlight of the whole meal, and I’m not normally a dessert person! It’s a simple dessert, amplified by a few exotic ingredients. The thyme really works well, and it’s an interesting touch to contrast the sweetness of the dish. The buttermilk in the panna cotta adds a tartness that balances the dish as well. Texture wise, the almonds and pomegranate add a crunch that I feel has been missing every other time I’ve eaten panna cotta! All in all, this is a very solid dessert that I’m very proud of! You should go and make it tonight. Fresh thyme, just the leaves from a couple sprigs. Reserve a couple of whole sprigs for plating. Lemon zest, the long stringy type, not from the microplane. Reserve the lemon for a bit of juice as well. 1. Place hot water in a ceramic bowl or ramekin, then sprinkle with the gelatin to absorb. Let stand for about 10 minutes. Meanwhile, use a paper towel to lightly spread the oil between four ramekins and prevent sticking. 2. Combine heavy cream and sugar in a saucepan and heat over medium. Stir continuously to dissolve sugar and prevent burning. Just before a boil, remove from heat and add the gelatin, buttermilk, and vanilla bean. When adding the vanilla bean, make an incision lengthwise and scrape the beans into the cream mixture with the back of the knife. Lightly stir mixture to combine, then transfer to the individual ramekins and refrigerate for at least 4 hours. 3. Heat the oven to 350 degrees F. Spread the almonds in a thin layer on a parchment or foil lined cookie sheet. Bake for 5-8 minutes, or until just starting to toast. Remove from oven, and combine in a bowl with the honey, lemon zest, and thyme leaves. Squeeze just a half of the lemon juice into the mixture, then transfer to the cookie sheet (doesn’t need to be in a thin layer at this point) and place in the oven for 5 minutes. The ingredients should combine into a sticky, oozing consistency. If the ingredients cool, it may turn hard like an almond brittle, but just pop it back into the oven for a few minutes right before servicing and it will soften up enough to plate. 4. To plate, place a dollop of honey on the plate offset from center. Invert the ramekins on the plate, and the panna cotta should slide right out. If not, heat the ramekin with some warm water for a few seconds, then try again. 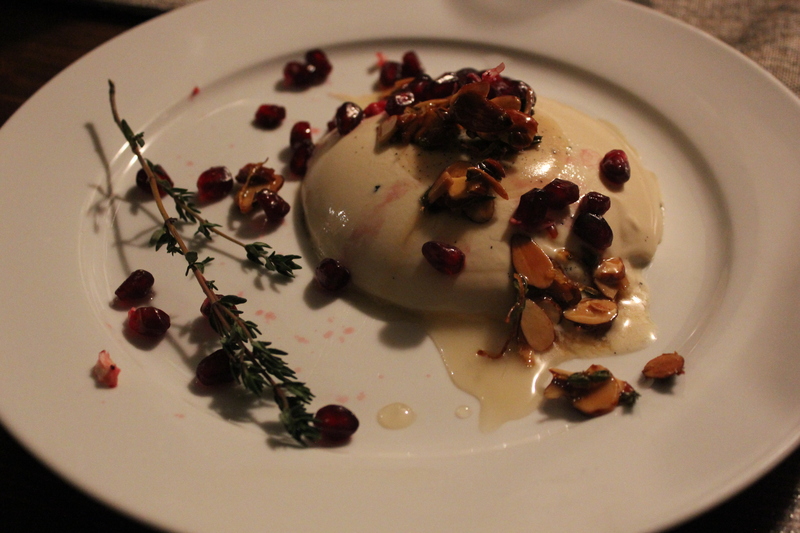 Sprinkle the almond mixture over the panna cotta, and top with the fresh pomegranate seeds. Garnish with a sprig of fresh thyme, and its now ready to serve. Thank you thank you! How do you make every post better than the one before it??? I have to be careful now, because this recipe is making me salivate so much that I might drool onto my keyboard. Haha, thanks Peter! Now you’re putting the pressure on me for the next one! This looks very nice indeed! Although I’ve been preparing Italian food for a couple of decades by now, I’ve never once made panna cotta. You’ve reminded me that I should fix that soon. Getting the texture of the almond mixture right sounds a bit tricky. Should it be warm when served or at room temperature? Thanks! It’s shocking you haven’t made it with the number of posts you have! Please let me know when you do, I’m interested to see what you do with it. The almond mixture can be a bit tricky, when I fist made this I did that ahead of time, but when it was time to garnish it was almost impossible to separate the almonds from the parchment. Quickly popping that in the oven at 300 F for about 5 minutes solved that. They were easily pliable enough to serve over the panna cotta. They cooled down by the time the panna cotta made it to the table, and hardened up a bit to a just candy-like texture which was appealing.